India’s economy is doing well and the prospects for the near future are also positive. This year, real GDP is forecast to increase 7.6%, accelerating further to 7.7% in 2017. The economy benefits from a stable political situation with a reform-oriented government, low commodity prices and a large inflow of foreign direct investments. Being the only country which has maintained its accelerated economic growth, the number of insolvencies is expected to decline this year and in 2017. Despite this positive outlook, the business climate in India presents some difficulties. Therefore, the protection of the business liquidity position against the risk of payment default arising from B2B trade on credit is of paramount importance. Survey findings in India shed light on how suppliers in the country manage trade credit risk in the current business environment. With an average of 45.3% of the total value of B2B sales transacted on credit terms (consistent with the 46% average for Asia Pacific, and stable compared to last year), suppliers surveyed in India appear to be more likely to sell on a cash basis than on credit terms to their B2B customers. This reflects the overall payment culture in India, which prioritizes cash and similar methods of payment over granting trade credit. The comparison showing the proportion of credit-based sales between Indian suppliers and their domestic and foreign B2B customers points to the suppliers’ markedly stronger preference to offer credit terms to customers in their home market, than to those abroad. 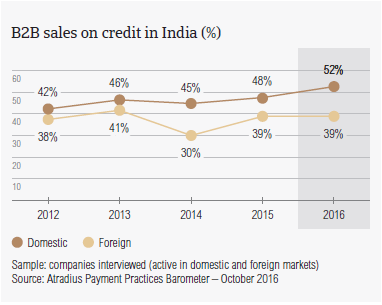 Nearly 52% of domestic and 38.6% of foreign B2B sales in India were made on credit terms (averages for Asia Pacific: 50.3% domestic and 42% foreign). The foreign figure in India appears to be lower than the regional average. This reflects the stronger preference of Indian suppliers for selling on credit domestically than abroad. As seen across most of the countries surveyed in Asia Pacific, with the exception of Australia and Hong Kong, the preference for trading on credit in the home market is likely to reflect a (local and regional) business culture where the security of sale, as well as the trustworthiness of the customers, are main concerns. This is particularly the case of companies which trade with overseas customers in markets where payment practices are not familiar to them. 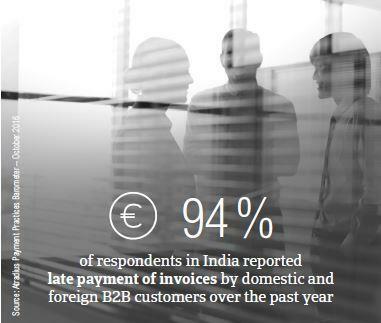 94% of respondents in India (88% at regional level) reported late payment of invoices by domestic and foreign B2B customers over the past year. 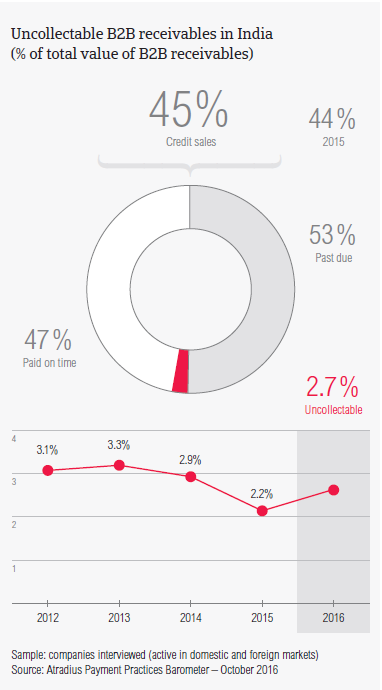 This resulted in an average of 53% of the total value of B2B receivables remaining unpaid past the due date, which is above the average for Asia Pacific (44%). On average, 55% of the total value of B2B invoices in India were reported to be paid late. 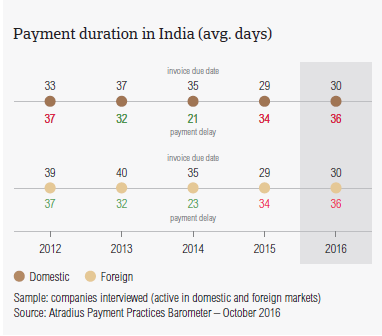 Domestic B2B customers in India paid invoices late equally as often as foreign customers did. Compared to last year, the foreign default rate in India increased from 49.6% to 51.1%, whereas the default rate on the domestic market remained stable. Besides reflecting the benign economic conditions in India, this is likely to point to suppliers’ strong focus on the assessment of creditworthiness and payment history of the B2B customers to whom they offer credit terms. Late payment of (domestic and foreign) B2B invoices in India is reflected in the Days Sales Outstanding (DSO) figure resulting from survey responses. This averages 48 days (regional average: 41 days), is the longest in Asia Pacific and is nearly two weeks longer than one year ago. This likely points to significantly lower efficiency in the collection of long outstanding invoices of high value. As it will be expanded later on in this report, more suppliers in India (11%) than on average in Asia Pacific (7%) are of the opinion that the collection of long outstanding invoices, also from emerging markets, is the greatest challenge to their profitability this year. 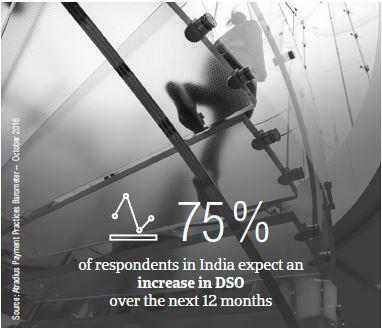 More than five times as many Indian suppliers expect an increase in DSO over the next 12 months (75%) than an improvement (15%). This may reflect their concerns about efficient collection of outstanding invoices. Only 14% of Indian suppliers do not anticipate changes in DSO over the same time frame. Most of the suppliers surveyed in India (approximately 21%, in line with the regional response rate) consider maintaining adequate cash flow levels as the greatest challenge to business profitability this year. This tallies with the earlier mentioned concerns about a likely DSO increase over the next 12months. This could worsen the liquidity position of Indian businesses’, besides increasing the financial and administrative costs required to carry long outstanding trade receivables. It is worth noting that a higher percentage of Indian suppliers (nearly 15%) than suppliers in Asia Pacific (11%) overall believe maintaining efficient receivables management is the greatest challenge they are being confronted with this year. This is consistent with Indian suppliers’ concerns about a likely increase in the DSO levels over the next 12 months. Most of the suppliers surveyed in India (70%) reported that they ask domestic and foreign B2B customers to pay invoices within an average of one month from the invoice date (average for Asia Pacific: 32 days). Over the past year, Indian suppliers did not change the average payment terms offered to both domestic and foreign B2B customers. Domestic and foreign B2B customers settle past due payments almost within the same time frame as they did last year (on average, 35 days after the invoice due date). It is worth noting that domestic B2B customers of suppliers in India appear to be the slowest to settle overdue invoices in Asia Pacific. Payment timing of overdue invoices from foreign customers (averaging 43 days late), instead, is the second lowest of the countries surveyed in the region, after those recorded in Australia. This means that Indian suppliers interviewed turn overdue invoices into cash, on average, around 65 days from the invoice date. This is slightly above the average for Asia Pacific (nearly 60 days). As many suppliers in India (46%, down from 51% last year) as in Asia Pacific expressed the opinion that their domestic B2B customers pay invoices late due to liquidity issues. Significantly more suppliers in India (40%) than in Asia Pacific (27%) believe that domestic customers delay payment of invoices most often to use the outstanding invoices as a form of financing for their businesses. The country response rate for this reason appears to be stable compared to one year ago, suggesting this is quite a strong belief among Indian companies trading on credit with domestic B2B customers. Interestingly, a sizeable percentage of Indian suppliers (35%) reported that domestic late payment occurred most often because the goods delivered and services provided did not correspond with what was agreed in the contract. This compares to a 21% response rate at regional level, indicating that this reason for domestic late payment is highly more frequent in India than elsewhere in the region. Consistent with the opinion expressed by most of the suppliers surveyed in Asia Pacific, the most frequent issue affecting credit based transactions between Indian suppliers and their overseas customers is the complexity of the payment procedure. This was cited by 44% of Indian suppliers (38% of respondents at regional level). Survey findings reveal that notably more Indian respondents (36%) than in Asia Pacific overall (24%) are of the opinion that the lack of correspondence between the goods delivered and services provided to what was agreed in the contract is one of the most frequent reasons for foreign late payment. As this reason was reported by a sizeable percentage of surveyed suppliers in respect to domestic late payment, one might infer that this is quite widespread in B2B trade practices of Indian suppliers. As a consequence of late payment by B2B customers, more suppliers surveyed in India (45%) than in Asia Pacific overall (34%) reported they had to take specific measures to correct cash flow. 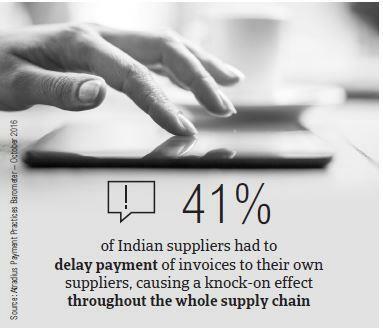 41% of Indian suppliers (33% in Asia Pacific) had to delay payment of invoices to their own suppliers, causing a knock-on effect throughout the whole supply chain. An extension of their bank overdraft was requested by 38% of Indian suppliers, compared to 22% at regional level. Interestingly, for twice as many suppliers in India (32%) than in Asia Pacific (16%), late payment of invoices from B2B customers meant delaying investment in property, plant and equipment, which prevented them from expanding their businesses. To protect their business against the risk of payment default from B2B customers, 45% of Indian suppliers surveyed (same in Asia Pacific) plan on checking the creditworthiness of their customers more and will monitor the credit risk associated to the customer more often over the next 12 months. Indian suppliers reported a proportion of 2.7% of the total value of B2B receivables (compared to 2.2% last year) was written off as uncollectable. This compares to an average of 2.1% for Asia Pacific. Domestic uncollectable receivables were written off more often than foreign ones. Uncollectable domestic B2B receivables originated most often from the agriculture, metals, construction, consumer durables electronics and financial services industries. In line with the regional response rate, 47% of the suppliers surveyed in India (compared to nearly 51% at regional level) reported that they wrote off receivables as uncollectable most often because the customer went bankrupt or out of business. 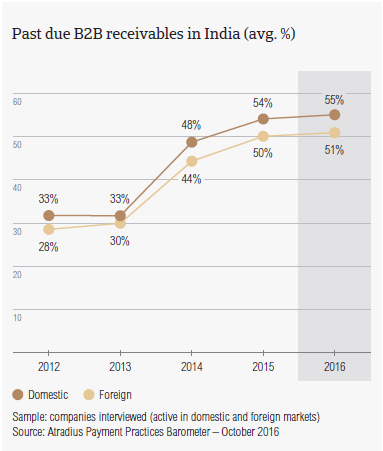 Significantly more suppliers in India (42%) than in Asia Pacific (33%) reported that they wrote off receivables as uncollectable due to either the debt being too old to be collected, or because the collections costs were too high. Suppliers surveyed in India reported trading on credit terms mainly with B2B customers in the agriculture, construction, chemicals, consumer durables, food, metals, machines and electronics industries. Invoice payment terms extended to B2B customers in the construction industry appear to be the longest (averaging 47 days from the invoice date) compared to all other industries with which suppliers surveyed in India trade on credit. These latter are significantly above the country and regional averages (around 30 days each). Despite being granted longer than average terms for payment of invoices, B2B customers in the construction industry take the longest to pay overdue receivables (on average, 60 days after the invoice due date). The construction industry generated the largest proportion of past due B2B invoices. Around 65% of the total value of B2B invoices issued by Indian suppliers in this industry were paid late. Based on survey responses, late payment of invoices due to liquidity constraints from customers occurred most often in the food and beverages and in the metals industries (67% of suppliers surveyed in India mentioned this). Nearly 55% of Indian suppliers (40% in Asia Pacific) reported that their B2B customers in the machines industry paid invoices late most often due to an intentional use of outstanding invoices as a form of business financing. Two in five Indian suppliers do not expect any change in the payment behaviour of their B2B customers over the next 12 months. 34% expect an improvement, 25% a worsening. Across all the other industries in India, the majority of the surveyed suppliers are of the opinion that B2B customers’ payment practices will improve over the same time frame. In particular, 52% of suppliers in the metals industry expressed this opinion. Deterioration in B2B customers’ payment practices in the construction industry is anticipated by 56% of Indian suppliers operating in this industry. Benefits from domestic steel demand growth will be offset by limits to raise sales prices due to the global steel overcapacity and cheap imports.